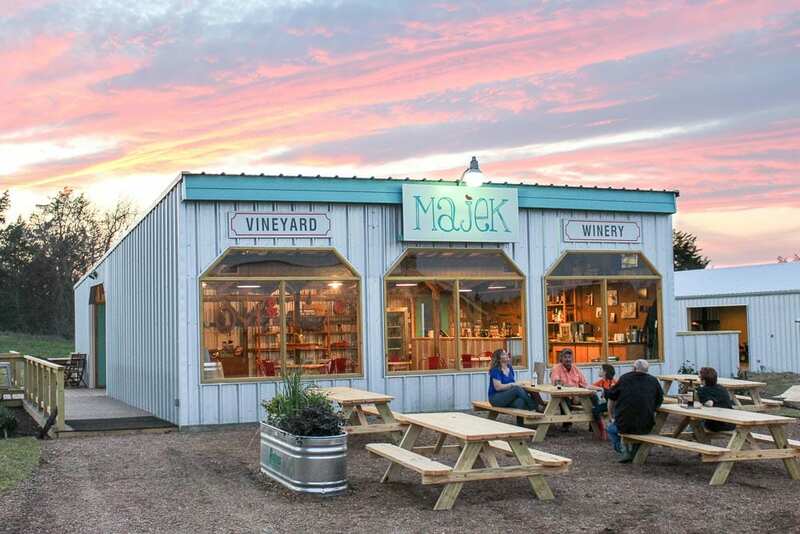 Majek Vineyard & Winery is a boutique Central Texas winery located in the scenic rolling hills off I-10, near Houston, Austin, and San Antonio. Owned and operated by Lynne and Randy Majek, we are open on Fridays from 4-7, and Sat-Sun from noon-6 for wine tastings and vineyard tours. Our vineyard & winery are developed on historic family property with a legacy of wine-making. Memories of family gatherings including music, food, and Grandpa’s Czech homemade wine have led us to develop a venue to share our passion for Texas music, local artists, and Texas wine. Our roots are reflected in everything we do, from our native sausage and cheese plates, First Saturday music, or by just sharing a beautiful place and a nice glass of wine with old friends and new. Our working 1.5 acre vineyard includes Blanc Du Bois and Black Spanish grapes, with our first harvest planned for 2015. We invite you to spend an afternoon visiting with friends in our old barn or outside with a view of the vineyard. Join us for great Texas music or our twice-monthly Painting Parties. Get away from the city and enjoy the big Texas sky, the constant southerly breeze, the beauty of the cardinals in the cedar trees, and a delicious glass (or bottle) of our wine, made exclusively from Texas grapes. In the meantime, follow our story as we grow our business, on our blog – la vina loca! Majek Vineyard & Winery is a proud member of the Texas Independence Wine Trail. We are located on historic CO RD 957 in Moravia (Schulenburg), Texas, conveniently centered among Houston, San Antonio, Victoria, and Austin. Na zdravíl!